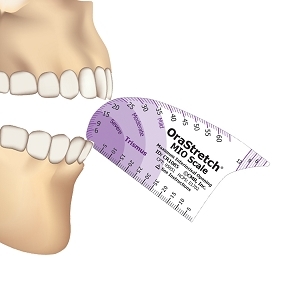 CranioRehab offers two types of OraStretch jaw measurement scales, each with unique benefits. Both scales are disposable and come in packs of 50. The OraStretch MIO scale is a rotational scale measuring openings from 6 to 60mm, with a mirror image on the back for easy self-viewing. In addition. the MIO scale includes a vertical ruler, a lateral ruler, jet scale, and a small opening ruler. If you are familiar with the TheraBite ROM scale, the OraStretch MIO scale is very similar with a number of improvements for easier usage and more measuring options. 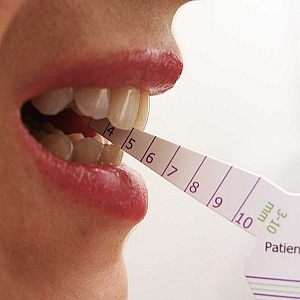 Alternatively, the OraStretch ROM scale measures a user's oral opening with vertical scales on three prongs. The ROM scale measures from 3 to 52mm. The prong vertical scale makes measuring and tracking very small openings (<10mm) much clearer for improved care. The ROM scale further includes a lateral ruler and a jet/protrusion scale. See each individual scale listing below for more information, ordering, and instructions. We also can customize both scales to be used as business cards or promotional items. See the Custom Printed OraStretch Scales for more information. You can also order small demo packs for testing out the scales.